2 years to the day from the untimely passing of the unequalled genius that is / was Prince, The SLST Train throws its annual celebration of the life & works of the ultimate showman + More on 4 floors. 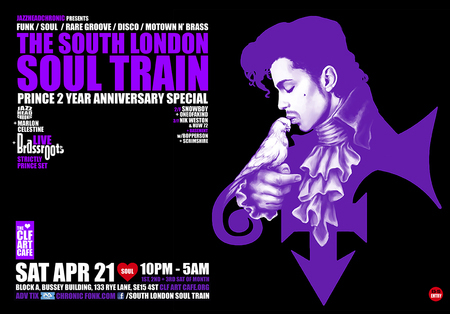 Sat Apr 21 – 2 years to the day from the sad, untimely passing of the unequalled genius that is / was Prince, The South London Soul Train throws its annual celebration of the life and works of the ultimate showman, composer, arranger and performer aka PRINCE ROGERS NELSON. Cult of Prince members JAZZHEADCHRONIC and The Mighty MARLON CELESTE worshipping at the Cuban heeled feet of the man who should of been called king and at one time had no name. Digging deep inside the Paisley Park and Warner Bros crates to rinse the complete Prince back catalogue (originals to remixes to collaborations) til your soul bleeds purple and you can’t take it no moh!!! Next stop “Alphabet Street”. JHC and MARLON C taking you deep inside the ultimate Purple Reign and dropping it like it’s 1999 – All night long. The duo of dancefloor nuking deck deft DJs joined LIVE by the equally hot BRASSROOTS who’ll be paying homage to the diminutive majestic purple one with a blinding Live 90 minute strictly Prince set + we got so much more on 4 floors at The CLF Art Cafe. Level 2 – Funks gonna seriously hit the floor as Legendary vinyl 45 Heads – The Legendary SNOWBOY & ONEOFAKIND! unleash more rare funked up soul n’ funk beasts on 45 direct to the seismically shifting dance floor and the whole ah you soul. Dropping it like torrential rain for daze – Dance like Thor cracking thunder. Absolutely positively Storming! Level 2 / Room 2 – S’all about the simply outstanding NIK WESTON & DJ HUW 72 who Promise another night of blistering eclectic, globalistic groove. Bringing tha audio love and serious vinyl pressure. Absolutely, Positively Taste.T. The SLST 4 floor line up completed in the Basement by DJs BOPPERSON & SCRIMSHIRE serving up more piping hot joints from the world wide soul underground. Runs 10pm – 5am / £5-13 Adv from RA or £15 OTD. Venue Details: CLF Art Cafe, Block A, Bussey Building, 133 Rye Lane, London SE15 4ST, United Kingdom. Artists / Speakers: [Level 1] Jazzheadchronic, Brassroots (live) Strictly Prince Set, Marlon Celestine, [Level 2] Snowboy, Oneofakind!, [Level 2 / Room 2] Nik Weston, Huw 72, [Basement / Rye Wax] Bopperson (First Word), Scrimshire (Wah Wah 45s). On The Door: GBP 15.